A new outdoor exhibit at the NASA Goddard Visitor Center, titled the "Astrobiology Walk," displays Goddard’s role in probing the origins of life on our world, in our solar system, and in the deep reaches of space. Goddard’s Astrobiology Walk consists of ten stations. Each station sits atop a stainless steel pillar and features two informational panels. 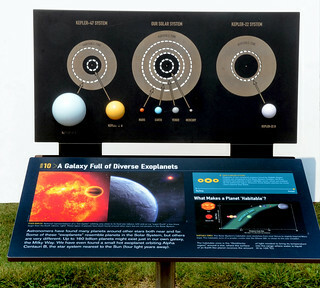 One, which visitors read as they overlook the Goddard campus, describes basic science concepts in astrobiology. The other, read as visitors face the Rocket Garden’s massive Delta rocket, explains Goddard’s contribution to that science. Quick-response (QR) codes at each station link visitors’ mobile devices directly to related web content. Each station is also crowned with a three-dimensional icon – a visual representation of the science concepts being presented, whether an amino acid, a stromatolite rock from Australia, or a detailed model of an early barren Earth. Two icons, depicting the topography of Mars and the nucleus of comet Hartley 2, are based on satellite images and laser altimetry measurements. Exhibitology fabricated these two models using 3-D-laser printing, with later refinements by graphic artists. Visitors are allowed – and even encouraged – to touch everything. The Astrobiology Walk was formally unveiled at a ribbon-cutting ceremony on October 2, 2013 at 2 p.m. EDT at the Visitor’s Center.